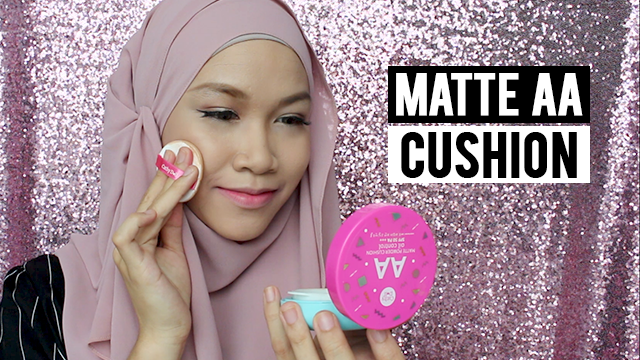 Today's video I am trying out a new Cushion Compact, Not BB or CC. But AA series! AA Cream has more benefits towards giving your skin that aura healthy looking, anti-acne and anti aging. This new AA Compact Cushion that also comes in a tube form delivers full coverage and matte looking skin. Watch my video below for the full look also before & after footage! The AA Series contains Pearl Pigment, Korean Herb & Tea Tree Oil. These ingredients protect and deliver an auto aura effect to the skin while controlling excess oil during the day. This cushion compact has a matte finish, medium to full coverage. I am using the compact n the shade Natural Beige. I find that it does cover my dark spot, redness and gives my skin looks fairer in a good way. I wore this on the entire day and I am pretty much impressed on how it lasted on my face. Just a little cakey on my forehead as I apply it to much, but so far my skin does not feels oily at all. I love how it has builable coverage. I am not using any powder on top and it does not melt off easily. As you can see in the video, I don't even use any concealer at all, which is pretty much amazing as you know I always use concealer in my makeup routine. In the video also I am using a few products from Cathy Doll. I use the 3D Face Forward Nefertiti Contour Kit as my highlighter on my brow bone, contour my nose and blush using my own brush. For my brow I am using the Triple Eyebrow Designing in 01 Blonde Brown with my Brow Definer Brush. For my eyeliner I use the Shocking Black Liner and finish my whole look with a gradient lip look with the Lip Blur in the shade Rose Apple & Pink Tango. Do check out more Cathy Doll products! They are one of the best affordable beauty brands out there! Where to buy Cathy Doll AA series? amazing betul the coverage, i watched your tutorial from the beginning till the end and it's obvious that the cushion is really full coverage! i'm actually looking forward to try new cushions so i'm gonna get this one from Guardian at Nu Sentral soon, sebab dekat dengan rumah :) thanks for the wonderful review and tutorial Sab!